A poster advertising the It’s All True Documentary Festival, held 25 March-5 April in São Paulo and Rio de Janeiro, Brazil, claims that popcorn “goes good” with documentaries too. Anyone who has laid out $20+ at the multiplex and munched through a buttered bucket during The Dark Knight (Christopher Nolan, 2008) would view this enticement with the same scepticism as any denizen of the dusty, last aisle at the video store. A king-sized bag of M&Ms with your copy of Darwin’s Nightmare (Hupert Sauper, 2004)? I don’t think so. This is no less true for those queuing up at It’s All True’s free screenings of international and Brazilian documentaries. A baby is abandoned by his drunken father, who is discovered to have repeatedly sodomised his infant son in Kim Longinotto’s Rough Aunties (2008). Images of Buddhist monks beaten by battalions of police are captured on cell-phone cameras aimed steps away from the violence in Anders Østergaard’s Burma VJ: Reporter i et lukket land (Burma VJ: Reporting from a Closed Country, 2008), native populations are massacred in a land grab by unscrupulous Amazon fazendeiros in Vincent Carelli’s Corumbiara (They Shoot Indians, Don’t They?) (2009). A mother of eleven mixes water and sugar as a regular meal for her children in José Padilha’s Garapa. Popcorn? During the screenings of the films in this year’s International and Brazilian competitions, the only popcorn consumed was to quell stomach pangs between back-to-back screenings. This year, the 14-year-old festival has been divided into two seasonal parts. The fall installment comprised International and Brazilian competitions for both short- and long-form documentaries, and several out-of-competition screenings that included a tribute to Israeli documentary maker Avi Mograbi and the première of the restored Ôrí, Raquel Gerber’s 1988 documentary tracing the threads of African history in the Brazilian national story. Simultaneously, the Festival hosted its ninth annual documentary conference, which consisted of four panel discussions on the theme of “The Engaged Documentary”. The Festival also co-hosted the theatrical openings of popular fare like Oscar-winner Man on Wire (James Marsh, 2008) and Simonal – ninguém sabe o duro que dei (Calvito Leal and Cláudio Manoel, 2008), about the Brazilian pop singer, which premièred at last year’s Festival. Informal chats with visiting programmers, directors, and scholars were sprinkled throughout. The second part of It’s All True will occur sometime in October – during the southern hemisphere’s spring – and will reportedly feature screening rubrics that have appeared in the past: “Focus on Latino Docs”, “The State of Things”, documentaries on current world events, and presumably more restorations, tributes and revivals. Founder and director of the Festival Ari Labaki says he divided the Festival in two in order to make it more manageable for festival-goers. As someone who has attended past editions of It’s All True, I missed the inclusion of curated historical sections this fall as they gave context to current works. For example, last year’s Festival highlighted experimental documentaries across the history of Brazilian cinema, a timeline that culminated in Carlos Nader’s competition-winner Pan Cinema Permanente (2007). In this year’s long-form Brazilian competition, Cidadão Boilesen (Chaim Litwak, 2009) beat out the other six contenders, taking home a $R100,000 cash prize. An excavation of an ugly footnote in Brazil’s recent history, Litwak’s documentary is another entry in the growing catalogue of left-leaning films about the Brazilian military dictatorship. Documentaries, including Hércules 56 (Silvio Da-Rin, 2006) and Condor (Roberto Mader, 2007), scrutinise topics specific to the military dictatorship, while films ostensibly on other subjects inevitably address the era’s consequences, which permeate political, economic and cultural life in Brazil to this day. João: The Brain Behind the Game (André Iki Siqueira and Beto Macedo, 2007), about a beloved soccer coach, and recent films about singers Caetano Veloso and Simonal all touch on, if not focus on, the dictatorship. Fiction features, like O Ano em que meus pais saíram de ferias (The Year My Parents Went on Vacation, Cao Hamburger, 2006) also use it as their driving forces. These films give a public airing to the crimes and grievances that the transition government swept under the rug with the enactment of the 1979 Amnesty Laws, and perhaps explain why the era remains magnetic subject matter for documentary makers and art-house audiences. Henning Albert Boilesen was a Dutch national who settled in Brazil and became the CEO of Ultra Group and an enthusiastic supporter of the generals who reigned from 1964 to 1985. He not only raised significant funds for Operation Bandeirante (OBAN), which hunted, captured, tortured and killed left-wing militants, but he also frequently dropped by OBAN headquarters for random torture sessions, occasionally taking part. Expertly handling a barrage of information, director Litwak uses an upbeat musical score, revelatory juxtapositions of contradictory testimonials and a rapid editing style that render otherwise unpalatable material a cathartic experience for survivors of the repressive régime and an infuriating one for those who took part in the repression. 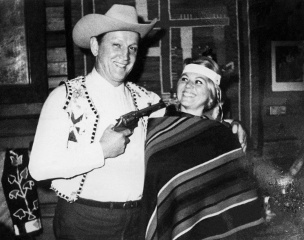 Put on a hit list by left-wing militants, Boilesen was eventually gunned down in 1971. When the former archbishop of São Paulo says in the film that he had refused to give Boilesen a Catholic service, nor would he mention his name in church, the audience gave out a collective whoop. When the son asserts that his father’s murder is just one more crime not prosecuted, a twenty-something sitting in front of me turned to his companion and exhaled a controversial, “I agree.” In an e-mail interview, Litwak told me: “That these issues are being discussed – in the context of the documentary – makes us very happy indeed.” He went on to say that he hoped his film would generate “new inquiries into this period. […] Above all […] the release of official documents, [which] is fundamentally important for any type of serious debate to take place”. Among the many preoccupations of activist filmmakers is the ability of their works to have a positive impact or even to instigate change. At the Festival’s parallel “Documentary Conference”, Avi Mograbi fielded a question about his own films, one hundred percent dedicated to the Israeli-Palestinian conflict. Listing a host of Israeli writers, filmmakers, and intellectuals who have tried and failed to influence the government to make peace with Palestine, the questioner asked Mograbi what should be done. His response: “I was going to ask you. I came here hoping you would know.” His films largely feature himself as a main character who, in a sardonic way, examines serious political issues. In his latest, Z32 (2008), Mograbi sings a song about his own willingness to protect an Israeli soldier involved in a war crime. Another conference participant wanted to know if dealing with such explosive political material had resulted in threats to him or his family. “I wish I would get one angry letter”, he said. Beyond his glibness, the implication was that no one is paying attention, even if they see his films. He gave the acclaimed Vals im Bashir (Waltz with Bashir, Ari Folman, 2008) as an example, explaining that coverage of the film in Israel addressed only “safe” topics like the innovative animation technique and the well-being of Israeli soldiers. The efficacy or morality of the government’s policy toward their neighbours was never mentioned. “Israel is not ready, I guess,” he said. Vincent Carelli’s Corumbiara tackles the issue of Brazil’s own population of displaced peoples. Through his production team at Video Nas Aldeias, Carelli has been shedding light on indigenous issues for more than 20 years, giving tribes the tools to film themselves and to share their stories. In the mid-’80s, he captured footage of a native tribe that had never before encountered white people. The video of astonished Indians aired at the time as a segment on a popular newsmagazine program, Fantástico. Carelli returns to this material in Corumbiara, exploring it in-depth. Alongside a representative of FUNAI (Fundação Nacional do Índio), Carelli enlists members of the Canoê tribe to gather evidence of a massacre that took place in 1987 and to document the existence of another threatened tribe. The true subject of the film becomes the steady attrition of native populations and how all efforts to prevent it, even the filmmakers’ at documenting them, actually contribute to their demise. In one remarkable sequence, Carelli lets the camera run while Tiramantu speaks at length in her own language in front of other natives and members of the crew. He wisely refrains from imposing explanatory voiceover, subtitles, or a musical soundtrack as we watch the last of this tribe transform before our eyes. 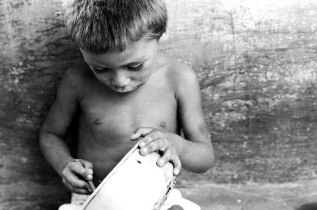 The 35mm documentary Garapa is an earnest attempt to draw attention to the urgent problem of hunger in Brazil. It comes from José Padilha, whose 2007 fiction feature, Elite Squad (Tropa de Elite), about the licensed-to-kill police force that terrorises Rio de Janeiro’s shantytowns, scandalised critics when it won 2008’s Golden Bear at the Berlin Film Festival. Not one to shy away from difficult or complex subject matters, Padilha, along with his production partner Marcos Prado (Estamira, 2004), explored the socio-economic roots of violent crime in 2002’s Ônibus 174 (Bus 174, José Padilha and Felipe Lacerda) and the human costs of deforestation in 1999’s Os Carvoeiros (The Charcoal People, Nigel Noble), which he scripted and produced. In Garapa, he has left behind the cinematic flashiness of Tropa de Elite and made a quiet tragedy in austere black and white, following three families as they face life in poverty. Hard-as-pebble beans are served up as the one meal of the day in Brazil’s burning north-eastern sertão. The mother of three from a slum on the outskirts of the city refuses to leave her alcoholic husband who we begin to suspect abuses one of the girls. Another mother is ineligible for state aid as she cannot supply the proper documents. Meanwhile the adults use cigarettes and cachaça to suppress their own hunger. Billing docs as entertainment may be one way to get “eyeballs”, but high ticket sales among the popcorn-munching crowd is not necessarily the goal of documentary makers looking to provoke change. Sure, few would turn down the audiences that Michael Moore has grown over the years. Even more would settle for earning a decent living making documentaries. Most are simply pleased to reach their targeted audience – no small feat. Yet my guess is every last one would prefer seeing their films make a difference than attract record numbers, not remotely the same thing. At the “Militant Documentaries” panel during the festival conference, Orlando Senna shared his memories seeing Santiago Álvarez’s Now! (1968), which inspired his own filmmaking. A montage of still images from the struggle for Civil Rights in the U.S., the seven-minute film is edited to the recording of Lena Horne’s eponymous song, which the singer gave to Álvarez after it was banned from U.S. airwaves. Senna described watching the film at a clandestine screening in the late ’70s in Salvador, Bahia, with someone “looking through a little window to see if the police were coming”. Álvarez, the Cuban revolution’s leading director, always avoided the documentary label, preferring to call himself a “news pamphleteer”, implying that his films could not only be put together quickly and cheaply but could also be distributed with the ease of a pamphlet handed out on the street. With the digital age upon us, many have hoped that the internet might become the equivalent of the street corner, where Senna imagines an 8th Art emerging. He envisioned an interactive media landscape replacing the old paradigm of “one film for millions to watch” with “millions chose your film to watch”. Whatever the technology, to be effective that pamphlet still must be read and the mind that reads it moved to act. When we’re gliding through this new and improved cybersphere and a message powerful enough to awaken our innermost activist flits across our screen, let’s hope our fingers aren’t so greasy from eating all that popcorn that they slip off the mouse before we can click through and do some good.